At doubleTwist, our exclusive focus is to serve the millions of digital music collectors that are increasingly neglected by the big guys in Mountain View and Cupertino. Over the past several years we’ve introduced a number of audiophile features such as lossless streaming support, 10-band EQ and casting for a wide range of AirPlay, Chromecast & DLNA-capable devices. But our latest update is bringing something new and unique: gapless playback support that works not only with songs stored locally on your phone but also, for CloudPlayer users, any music stored in the cloud on a Dropbox, OneDrive or Google Drive account. This means you can finally listen to your DJ mixes or iconic albums like Pink Floyd’s Dark Side of the Moon without any annoying gaps between tracks. It will work regardless of whether it’s a download or a stream, a set of files on your SD card or a folder in a distant datacenter. Keep in mind that for a true gapless experience, your music tracks need to contain special metadata telling the player how to properly play the songs. As long as you ripped the tracks using an app that can correctly embed this metadata (like iTunes or EAC/LAME), they will play without any issues. Gapless playback is supported for MP3, AAC, FLAC, and ALAC. The new update is now rolling out on the Play Store for both CloudPlayer and doubleTwist Classic Player. doubleTwist CloudPlayer has become very popular among OneDrive users & audiophiles looking to manage and stream their music collection in the audio format of their choice. One common complaint we received was that CloudPlayer was too slow in importing songs from OneDrive for first time users. Well, we listened and greatly improved the import speed of MP3/M4A audio tracks to make it lightning fast. Artwork import and indexing of FLAC lossless audio is slower and we’re working on optimizing it for a future release. And to spice things up, we also added a brand new blue theme as an option in the Settings. 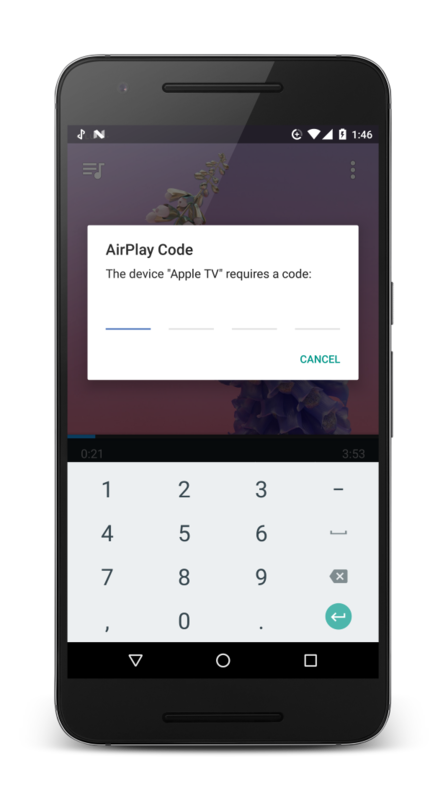 Back in May 2011, we were the first to bring AirPlay music streaming to Android, helping hundreds of thousands of Android users listen to their favorite tunes through their Apple TV and other AirPlay-compatible devices. 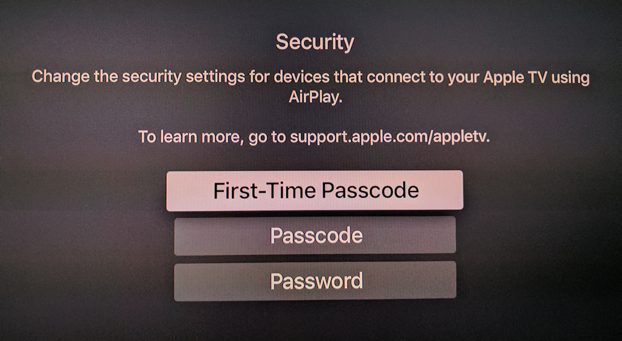 Fast forward to April 2017 and Apple, in a surprising and anachronistic move, released a 4th generation Apple TV firmware update (tvOS 10.2) that blocked 3rd party apps from supporting AirPlay by requiring a proprietary pairing process conveniently restricted to Apple apps and devices. Yep, Apple wants you to switch to an iPhone if you happen to own an Apple TV! But users today demand interoperability between their devices. Modern households are diverse ecosystems of connected devices, full of iPhones, Android phones, smart TVs and a cacophony of gadgets. So we went ahead and added support for Apple’s new pairing process in the latest doubleTwist Pro release because we believe the era of walled gardens is long gone. The AirPlay functionality is also live for CloudPlayer so you can stream your cloud music to your Apple TV. 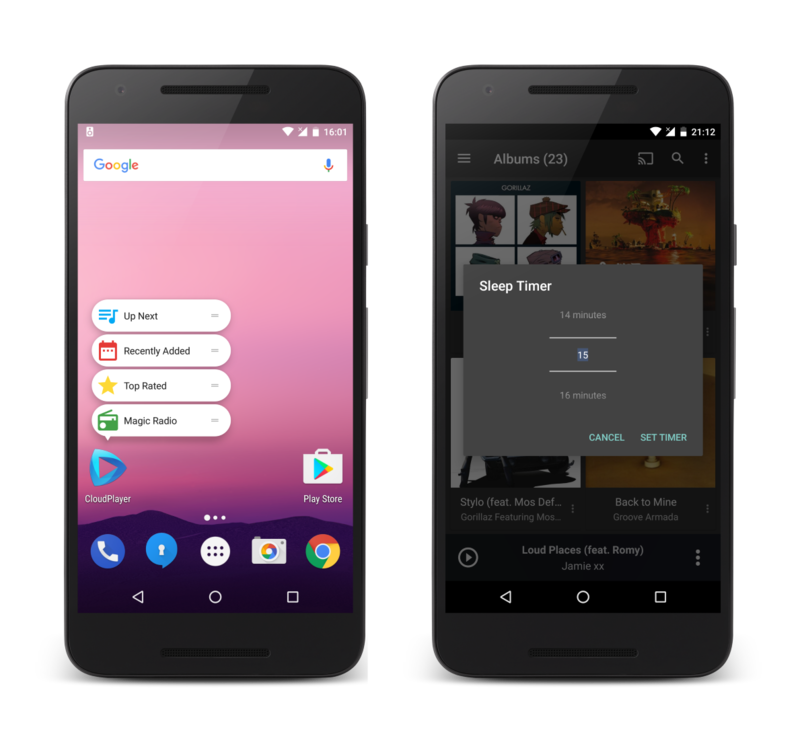 Today we released a delicious update to CloudPlayer introducing two highly requested features: a Sleep Timer and for the lucky ones on Android 7.1 & higher, app shortcuts. With CloudPlayer’s new app shortcuts you can launch straight into the Up Next screen to view your play queue, browse your recently added & top rated songs or launch Magic Radio. Plus we also made improvements to the Android Auto voice query support so you can more easily change music in your car. And for those of you who prefer to listen to your music offline, we also updated doubleTwist Pro with the same great features. A while back, we released CloudPlayer, an open Play Music alternative that links with Dropbox, OneDrive and Google Drive so you can listen to all your music, everywhere without restrictions or phone storage limitations. But what if you don’t want to use your precious wireless data? In the past several months, we’ve been working on a complete revamp of our older and more well known app, doubleTwist Classic Player, which is optimized for offline listening and music sync. Today, we’re making available for public testing on the Play Store an alpha version of doubleTwist Classic, that was built fresh from the ground up. Missing features that are planned for a future release include gapless, crossfade, podcast support, UPnP/DLNA support and AirPlay video support. SIGN UP TO TEST: If you’d like to give it a try, you can sign up for the Play Store alpha and let us know what you think on our forum. One year ago we launched doubleTwist CloudPlayer, a powerful music player that lets you build your own, personal music streaming service. 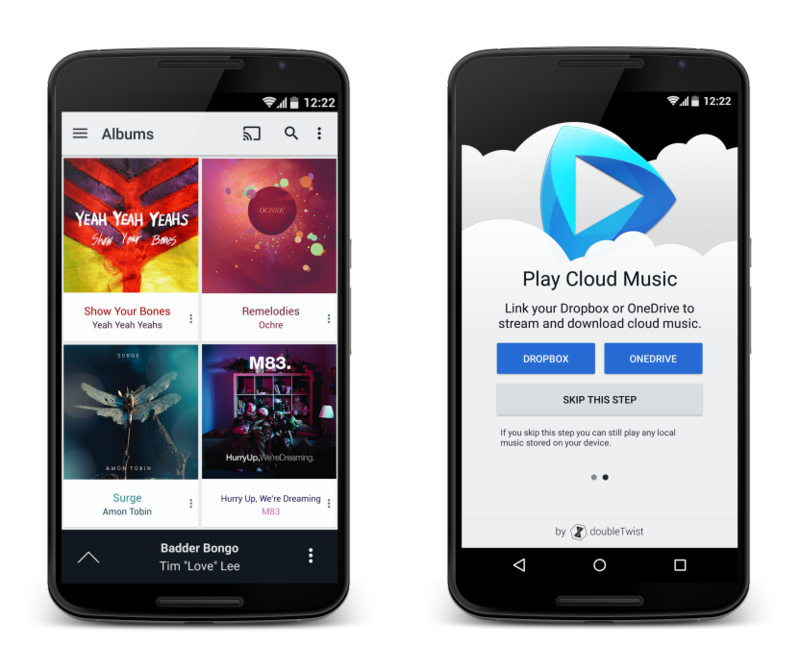 CloudPlayer integrates directly with Dropbox, OneDrive and Google Drive, creating a giant cloud jukebox that can be easily accessed and managed from any Android device. Now we’re taking CloudPlayer one step further, by introducing cloud playlists. Cloud playlists used to be a feature of subscription music services. Not anymore. CloudPlayer remembers and restores the playlists you create, so you can buy a new phone or use a second device without worrying about losing your playlists. 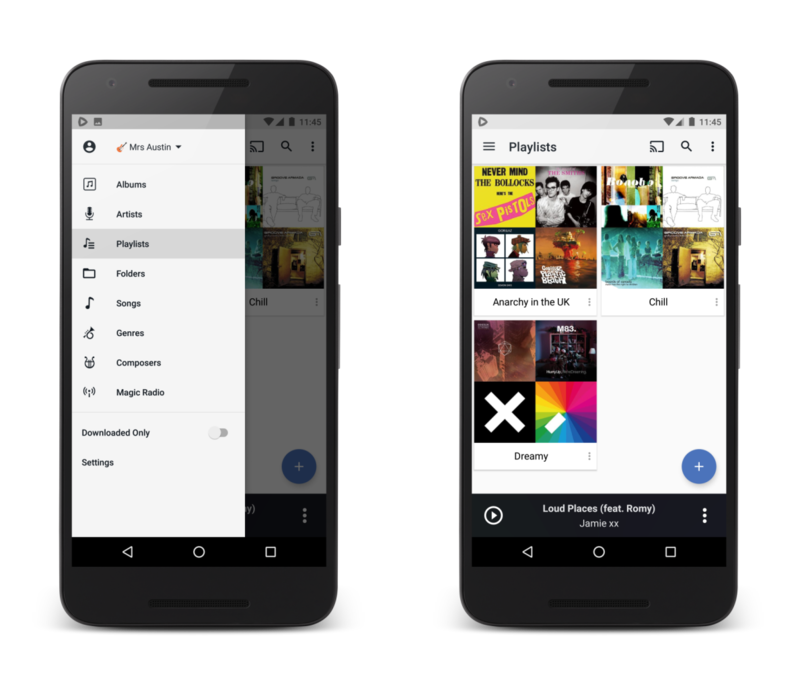 CloudPlayer playlists can contain songs from multiple sources: Dropbox, OneDrive, Google Drive as well as songs locally stored on your phone. It doesn’t matter where your songs are stored, CloudPlayer takes care of the complexity so you can sit back and enjoy your music. Cloud playlists are available to all CloudPlayer users, even the ones who haven’t upgraded to the premium version of the app. The update is available starting later today from the Play Store. 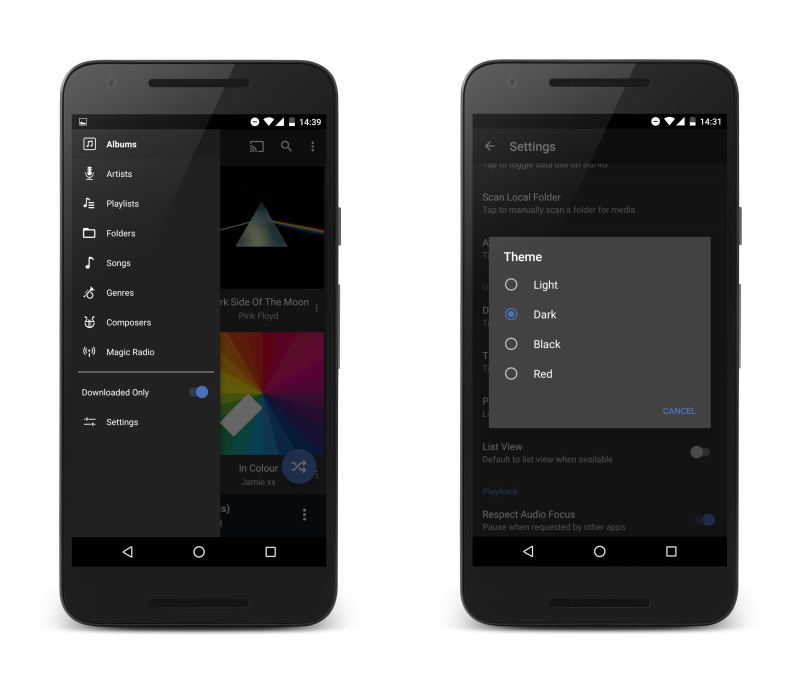 The latest release also introduced a brand new theme engine and an easy on the eyes dark theme, perfect for night owls and fallen Jedis alike. Give it a spin! Today we are launching a major new app called CloudPlayer™. With CloudPlayer, anyone can turn their favorite cloud service into a giant personal jukebox. We are launching on Android first and will support Dropbox, OneDrive and Google Drive out of the box. We created CloudPlayer to provide an alternative to crippled, proprietary cloud music lockers that impose painful restrictions on what you can do with the music you own. These user-hostile terms are usually hidden in the fine print of cloud music offerings by major corporations and impose arbitrary limits on the number of “authorized devices”, restrict the number of times you can download your music, and penalize music enthusiasts who own multiple gadgets or frequently upgrade their phones and firmware. CloudPlayer is a next-generation music player that can manage and stream your personal music collection no matter where it’s stored. It supports hi-fidelity lossless audio, and universal casting to Chromecast and AirPlay devices. For example, you can stream a song from your OneDrive or Dropbox to your Apple TV or Chromecast. You can even link multiple cloud services, which comes in handy when you have a large music library or wish to listen to music uploaded by another family member. Our philosophy at doubleTwist has always been to break down walls that large corporate entities build around their platforms to lock you down and we believe CloudPlayer achieves this. 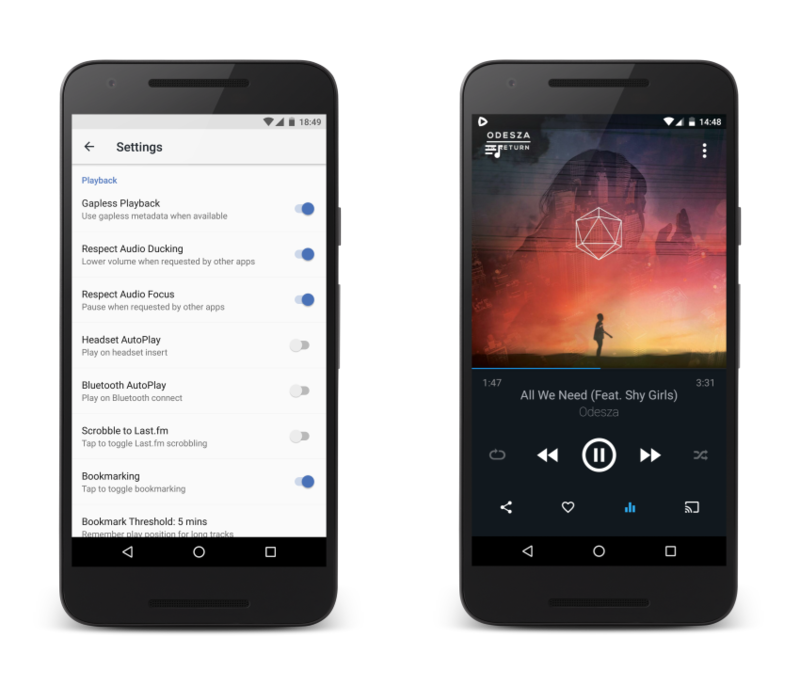 CloudPlayer features a snappy material design UI, premium sound, lossless audio, bass boost, 10-band EQ, ability to select songs and playlists for offline playback, and built-in AirPlay and Chromecast support. Get it now from the Play Store and take back control of your music. doubleTwist Sync for Windows is here! We completely reinvented the doubleTwist Windows app to make it lighter, faster and more powerful. MTP support: now you can quickly sync thousands of songs to your phone or tablet from your local music library over USB. Complete integration with iTunes: doubleTwist Player on your Android now automatically pushes ratings, playcounts and playlist edits back to iTunes, keeping everything up to date. More sync options: You can now sync music based on Artists, Albums, Genres or Playlists you previously created in iTunes or Windows Media Player. The new Windows app works seamlessly with doubleTwist Music Player for Android to deliver a truly amazing music experience whether you Sync, Listen or Stream. From doubleTwist Sync, to doubleTwist Music Player and Magic Radio, you can now do it all without sacrificing ease of use. Our vision has always been to deliver to you music without boundaries and we believe doubleTwist Sync is another step in that direction, breaking the artificial walls that Apple, Google and Microsoft build around their platforms to constrain you.